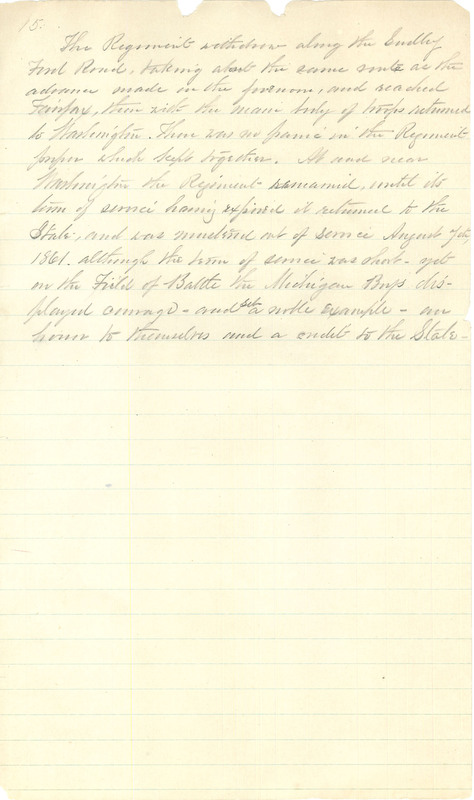 DIY History | Transcribe | Civil War Diaries and Letters | Account of the Battle of Bull Run, 1861 | 1861-Battle of Bull Run-Page 29. 1861-Battle of Bull Run-Page 29. The Regiment withdrew along the Sudley Ford Road, taking about the same route as the advance made in the forenoon, and reached Fairfax, then with the main body of troops returned to Washington. There was no panic in the Regiment proper which kept together. At and near Washington the Regiment remained, until its time of service having expired it returned to the State; and was mustered out of service August 7th, 1861. Although the term of service was short - yet on the Field of Battle the Michigan boys displayed courage - and set a noble example - an honor to themselves and a credit to the State.